Casey M. "Buddy" Smith, Jr., is Senior Vice President of American Family Association, ordained Elder (retired) in the United Methodist Church, active in music evangelism as a soloist and sings locally with Joyful Noise Quartet. He and his wife, Carol, make their home in Plantersville, Mississippi. Carol and I served as pastor of Christ United Methodist of Indianola, Mississippi from 1982 until 1989. 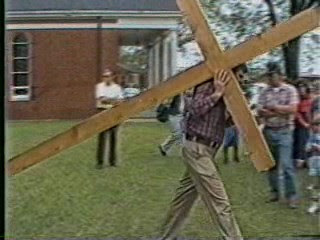 On Good Friday 1988, we began a tradition for area Christians of carrying the cross through the streets of Indianola. 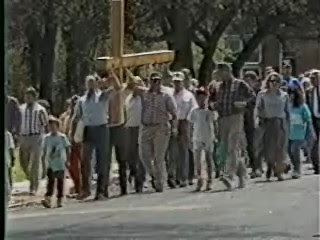 Click here to see a video presentation of that first “Walk with the Cross” in Indianola. Harold and Teresa Manning were beloved members of our Church in Indianola and now serve as pastor of Friendship United Methodist Church in Peppertown which is near our home. Today, Carol and I had the blessing of taking a Good Friday “Walk with the Cross” with our cherished friends, Harold and Teresa Manning. There were a number of area pastor's who joined with their congregation in commemoration of this holy day. We all then enjoyed a delicious meal prepared by Teresa at the church after the walk. Christian pilgrims from around the world filled the narrow cobblestone streets of Jerusalem's Old City on Good Friday, some carrying large wooden crosses as they followed the route Jesus took on the way to his crucifixion. Read the story at the Jerusalem Post online. The “Our Daily Bread” devotional that follows is worth a read on this Good Friday. When Jesus died on the cross, He paid for the sins of the human race. Only those who believe on Him, however, can receive His loving provision. The sacrifice of Christ is sufficient for all, but it is effective only for those who place their trust in Him. As the Lord Jesus hung on the cross, two criminals were crucified next to Him. One of those men is now in the place of the lost—his doom in hell forever sealed. The other is with Christ—his place in heaven assured for eternity. Their contrasting attitudes toward the Man on the center cross made all the difference. One of the criminals railed at the Lord in unbelief. The other cried out in faith, “Lord, remember me when You come into Your kingdom” (Luke 23:42). 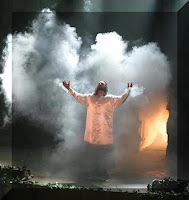 To him Jesus said, “Today you will be with Me in Paradise” (v.43). We are all represented by one of those two men. We either believe on Christ or we reject Him. Our eternal destiny depends on our decision. Jesus said of Himself, “He who believes in Him is not condemned; but he who does not believe is condemned already” (John 3:18). At Calvary's cross, we stand at the crossroads to heaven or hell. It's Easter Sunday morning and Carol and I wish for you a glorious Resurrection Day celebration. Our good friends, Eric and Debbie Horner, have produced and shared a wonderful online Easter slide presentation titled - The Third Day. Finally, this Campus Crusade for Christ International website presents a powerful presentation of the meaning of Easter titled - Who Is Jesus? Rev. Cecil Williamson - evangel of good news! 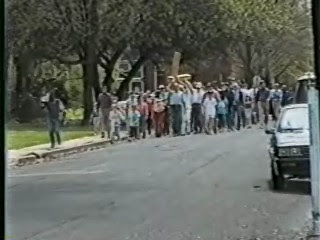 Grand Marshalls - Marion & Joan Smith from Buddy Smith on Vimeo .